6 Feb 2019 – Last year was the fourth-hottest year ever recorded, according to the National Oceanic and Atmospheric Administration and NASA, which means that the past five years have been the five warmest years in the modern record. NOAA and NASA discussed 2018’s global temperature and climate in a joint news conference today; both agencies maintain independent data that goes back to 1880 to monitor temperatures around the globe. The announcement was delayed several weeks due to the government shutdown that resulted in many NOAA and NASA employees being furloughed. If it seems like you’ve heard this before, you have: Eighteen of the hottest 19 years have occurred since 2001. 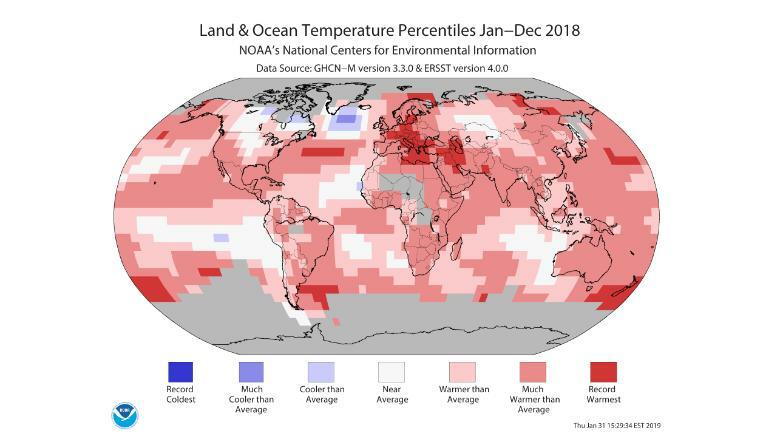 Global average temperature anomaly for 2018, from NOAA. Warmer colors indicate temperatures above average, while cooler colors indicate below average temperatures. “2018 is yet again an extremely warm year on top of a long-term global warming trend,” according to Gavin Schmidt, director of NASA’s Goddard Institute for Space Studies. The average global temperature has risen about 2 degrees Fahrenheit, or a little over 1 degree Celsius, since the 1880s. That puts us more than two-thirds of the way to the warming limit of 1.5 degrees Celsius that was set in the Paris climate agreement. “This warming has been driven in large part by increased emissions into the atmosphere of carbon dioxide and other greenhouse gases caused by human activities,” Schmidt said. Record warmth was seen over much of Europe for 2018, which saw summer temperatures well over 90 degrees Fahrenheit — over 32 degrees Celsius — all the way up to the Arctic Circle. Record warmth extended along the Mediterranean and the Middle East, as well. Temperatures continue to warm fastest in the polar regions, where alarming melting of ice was once again observed in 2018. Annual sea ice extent in both the Arctic and the Antarctic regions in 2018 was the second smallest on record; both poles came in just behind 2017, which was the record smallest since satellite observations of the region began in 1979. 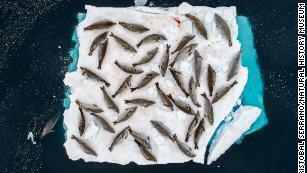 Last year also saw the melting of what is believed to be some of the oldest ice in the Arctic, north of Greenland — which scientists believed would be the “last bastion” to be melted by climate change. In addition to the loss of sea ice, ice continues to melt from the Greenland and Antarctic ice sheets, according to Schmidt. Loss of ice mass from these important ice caps contributes significantly to sea level rise. The contiguous US average rainfall of 34.63 inches made 2018 the wettest year in 35 years and the third-wettest year since records began in 1895. Extremely heavy rainfall events such as Hurricane Florence and the flash floods in Ellicott City, Maryland, stand out as examples of extreme precipitation that are consequences of a warmer climate. Warmer air can hold more moisture, making more available during storms. Nine states in the eastern United States had their wettest years on record: Delaware, Maryland, Massachusetts, New Jersey, North Carolina, Pennsylvania, Tennessee, Virginia and West Virginia. 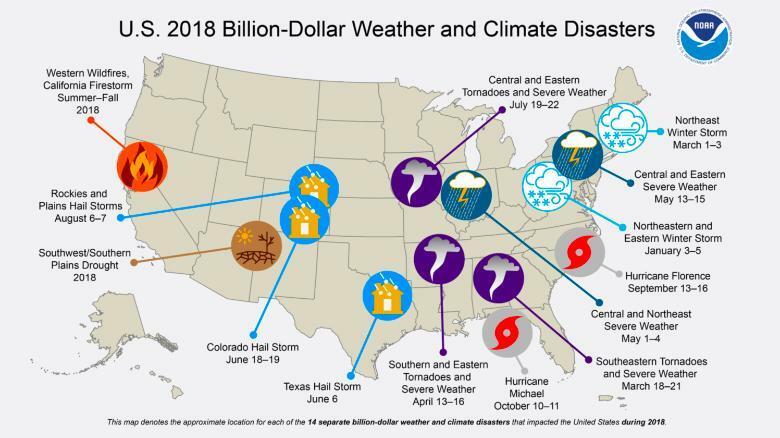 There were 14 separate weather and climate disasters that each exceeded $1 billion in damage last year. In total, the events cost $91 billion, according to NOAA estimates, of which $73 billion came in three major events: Hurricanes Michael ($25 billion) and Florence ($24 billion) and the Western wildfires, which included the Carr and Camp fires in California ($24 billion). The past three years have set records for billion-dollar disasters striking the United States, with 45 separate events. The long-term, inflation-adjusted average is 6.2 events per year, so the United States has nearly tripled that pace since 2016. “This has been a historic period of weather and climate extremes,” said Adam Smith, lead researcher at NOAA’s National Centers for Environmental Information.